When you’re first getting started, we can guarantee you one thing: Your chicken coop is the most important supply you need to get. It’s your chickens’ home, protecting them from the elements, giving them a safe place to lay their eggs and guarding them against predators. But we can also guarantee you that buying a chicken coop will also likely be the most expensive supply you need to get. The good news is that you don’t need to be a handyman and build your own coop in order to save money! We’ve checked out and reviewed some of the best chicken coops on the market. They range from the stylish to the utilitarian, but there’s one thing they have in common: They hit all the important points and are perfectly sized for the casual backyard or urban hobbyist. Best of all, they’re available online and can be delivered right to your doorstep. There are a few different spacing requirements to keep in mind when trying to decide what chicken coop to buy. The first is floor space. Most medium- to large-sized chicken breeds need approximately 3 to 4 square feet of space per chicken. This gives the chicken enough room to stretch its wings, run around and socialize. You also want to watch for ventilation space. You want approximately a square foot of ventilation per 10 square feet of floor space. Chickens don’t like to sleep in the floor but will instead want to get themselves up on a perch or roost. This also helps protect your flock from predators. The roosts in the chicken coop should be approximately 24 inches high. The length of the roost is determined by how many birds you plan to raise in the coop. Plan to give each chicken 10 inches of space on the roost. Thus, a flock of six hens will need 60 inches, which could be split up between two 30-inch-long perches. The best chicken coops, whether you buy them online or in-person at a farm store, have adequate nesting boxes for egg layers. Ideally, the nest box is one square foot around, and you should aim to have one nest box for every four egg-laying hens. More people want their chickens to experience fresh air and grass. Some pre-made or prefab chicken coops that you can find online come with extensions that allow you to attach an open fenced area for your flock to roam and enjoy nature. Studies show that free ranged eggs may actually be healthier than non-free ranged eggs, so this may be an important feature that you want when shopping for a chicken coop. We checked the specs. We read the reviews. We asked other farmers and hobbyists. Here are our recommendations for the best chicken coops (not chicken plans) that you can get from Amazon. We are obsessed with this popular chicken coop, especially if you’re one of the many people who deem a free ranged run as a critical part of their chicken coop. The run connects seamlessly to the enclosed part of the coop. The run is covered on all sides and at the top to protect against predators like hawks, and the fine mesh allows your chickens to experience the sun and breeze easily. Inside the coop you’ll find a large nesting box. Based on the size of this prefab chicken coop and the size of the included nest, we would recommend this coop for a backyard chicken flock of four or five hens. There are also several roots, which help accommodate all of the chickens comfortably. We especially loved the ramp, which lets your chickens scamper up and down into their run. Its overall size is 59 inches long and 40 inches wide. The run comes designed so you can leave it open at the top (we would not recommend this) or have a flat or peaked top depending on your personal design aesthetic. 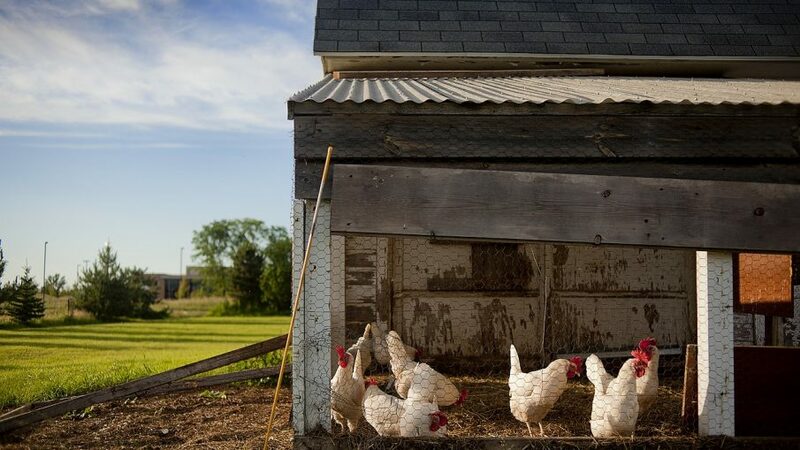 This multi-level chicken coop ingeniously combines a run and a coop. However, the coop is perched off the ground with a ramp leading to the ground. This allows the chickens to roam under the coop in a free range setting, but takes less total square feet than a traditional coop and run. This efficient space-saving set up is perfect for urban hobbyists raising chickens in the city. Another feature we loved is the nesting box. It’s positioned on the edge of the coop with a flap on the door. This lets you easily check for (and gather) fresh eggs without having to go into hte coop itself. This tower-shaped chicken coop will catch your eye due to its unique shape. It’s important to note that this model doesn’t include an enclosed run, but it’s also much more compact than the other two top-rated chicken coops. It’s designed with a small hobbyist in mind, as it can only accommodate two chickens. However, that’s perfect for someone who is very short on space or someone who doesn’t need a very big flock. We loved how it was constructed of cypress fir, which looks rustic and natural but is also resistant to rotting so your coop lasts a long time. This coop includes a nesting box with a flap in the door for easy access from the outside. The coop’s ramp can also be pulled up to create a door, securing the chickens inside at night or during bad weather.